PROUDLY SERVING THE DURHAM REGION FOR OVER 30 YEARS! Steam Magic is the Durham Region’s source for quality carpet and upholstery cleaning for residential and commercial properties. With more than 35 years’ experience, we also offer homes and businesses carpet and upholstery deodorizing, spot removal and fabric protection. Our technicians look forward to meeting the challenges of each project, and we have the know-how to help you extend the life and beauty of your carpeting or furniture fabric. 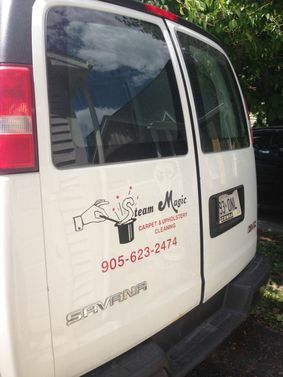 Proudly serving the Durham Region for more than 35 years, the focus at Steam Magic has always been your 100% customer satisfaction and providing our professional services at reasonable rates. Our technicians are always punctual and reliable, and we’re fully insured. Every carpet cleaning comes with a free carpet deodorizer, too, so call us to schedule your free estimate today! Our Stain Removal Guide can help you maintain your carpet’s lustre. Bright, clean high-traffic areas make a great first impression. Use our eform to ask us a question or schedule your free estimate.